Toyota will build the first megawatt-scale hydrogen fuel and renewable generation plant, setting a new energy benchmark that experts hope with pave the way for Australia's hydrogen industry. Toyota North America will build the plant to support its operations at the Port of Long Beach, in the US, using agricultural waste to generate electricity, water and hydrogen. Dubbed the Tri-Gen facility, the plant will generate around 2.35 megawatts of electricity and close to one tonne of hydrogen per day, providing enough daily power for more than 2300 homes and 1500 hydrogen-powered cars. It will come online in 2020, and be used as proof of concept for large-scale hydrogen generation and renewable energy plants. "Tri-Gen is a major step forward for sustainable mobility and a key accomplishment of our 2050 Environmental Challenge to achieve net zero CO₂ emissions from our operations," Toyota North American group vice-president for strategic planning, Doug Murtha, said. CSIRO principal research scientist Michael Dolan told Fairfax Media this plant was a benchmark for the industry. "Once someone goes first it paves the way for others, and hopefully this is something Australia can learn from," Mr Dolan said. The CSIRO recently announced its intention to make Australia a hydrogen fuel world leader, investing millions into research using renewable energy such as solar, instead of biowaste, to generate hydrogen. CSIRO energy director Karl Rodrigues told Fairfax Media the research would put the nation first in the region. "This is a great opportunity to take a global leadership position," Dr Rodrigues said. Australian National University associate professor Ron Pace said Australia was making strides forward with hydrogen fuel technology. He said a group from ANU and the University of Wollongong was creating a "completely novel" process based on nature to generate hydrogen and water. "We hope to see it start to emerge next year," Dr Pace said. South Australia has also put hydrogen forward as a pillar of its new energy plan. "Hydrogen offers an opportunity to create a new industry in South Australia where we can export our sun and wind resources to the world," South Australian Energy Minister Tom Koutsantonis said. "Our Hydrogen Roadmap aims to have South Australia at the forefront of hydrogen development in this region within the next decade," he said. "Within two years, commuters in Adelaide will be able to ride on the first of a fleet of hydrogen-powered buses using locally produced fuel. Within three years, South Australia will have the capacity to export its first hydrogen supplies produced using our renewable energy assets." A recent industrial roadmap developed by the Hydrogen Council – a consortium comprising nearly 30 industrial, energy and automotive companies – found that by 2030, between 10 million and 15 million cars and half a million trucks will be hydrogen-powered globally. It forecasts annual hydrogen demand to reach almost 80 exajoules (80,000 petajoules) in 2050, accounting for 18 per cent of total final energy demand under the Paris Agreement plan. 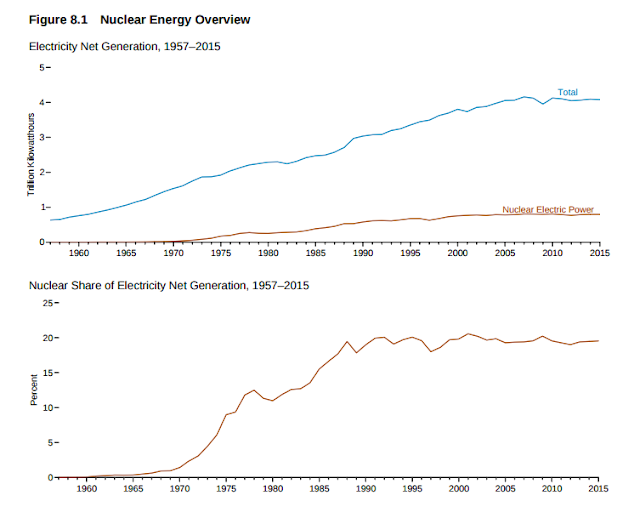 The share of nonhydro renewable consumption is actually lower today (10%) than it was in 1908 (15%). This is a factor of both lower energy consumption as a whole and a large amount of biomass (in this case wood) consumption 100 years ago. 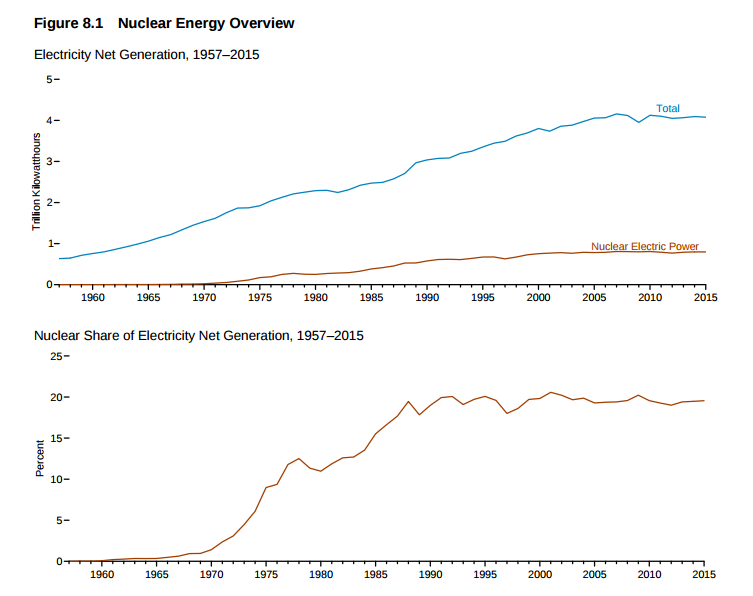 Today, while the nonhydro renewable share of total energy consumption is lower than in 1908, solar and wind generation continue to increase and make up a large percentage of total nonhydro renewables. 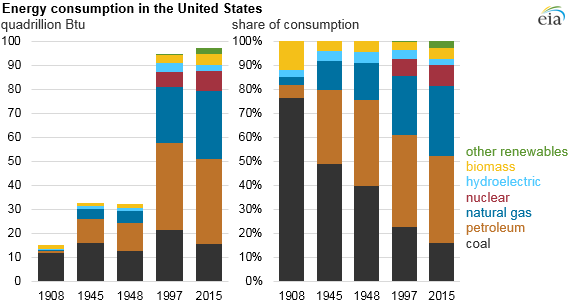 Despite the changes in fuel sources, fossil fuels have continued to make up a large percentage of U.S. energy consumption. In 1908, fossil fuels accounted for 85% of total consumption. When the Indians won the World Series in 1948, that share had increased to 91%, as petroleum and natural gas had begun to account for increasing amounts of energy consumption. Fossil fuel consumption has fallen in recent years, accounting for 81% of total consumption in 2015. 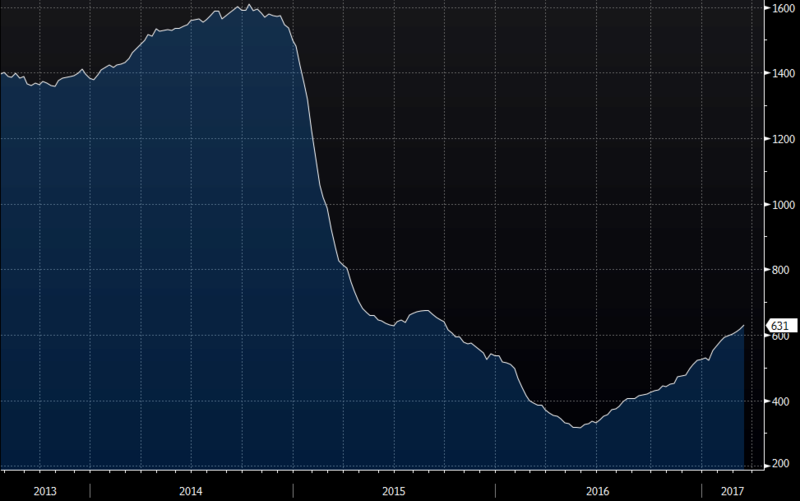 US Oil Rig Count is at a current level of 631.00, from last week and up from 386.00 one year ago. This is a change of 14 from last week and 63.47% from one year ago.